There is a general agreement among academics, journalists and policy makers that piracy cannot be defeated at sea. It has to be fought on land. Since the Transitional Federal Government (TFG) is too weak to do so, many point to regional states as potential partners of the international community. Especially Puntland seems to be a good candidate, given that many pirates operate from its territory. However, some experts claim that the Puntland authorities are in fact involved in piracy. In this blog entry we will briefly introduce Puntland and its difficult (but inevitable) role as a local ally in the fight against piracy. Puntland has so far remained a largely peaceful place, at least compared to the war ravaged south. The state provides basic but essential governance services. The economy is recovering and the port of Bossaso has become a major regional trading hub. There are several UN agencies and NGOs operating in Puntland and also the European Commission, the biggest donor in Somalia, has a liaison office in the region. Puntland’s leaders frequently travel abroad to meet with officials and representatives from the international community. In January 2009, the parliament elected Abdirahman Mohamud Farole as the country’s new President. However, Puntland’s stability remains fragile. Poverty rates are disastrous, security forces are weak and underpaid and corruption is rampant. Clan struggles persist, criminal networks and pirates often operate freely and Islamic groups have recently become a major security problem. Relations with neighboring Somaliland are strained due to a border conflict. Puntland has always been involved in regional and Somali politics. Abdulahi Yusuf, the first President of the TFG (2004-2008), is also a former President of Puntland. Nevertheless, during the past decade it has received little attention from the international community, which focused primarily on supporting the TFG in Mogadishu and the democratization process in Somaliland. This, however, could change in the coming months and years. In September, the US announced a major shift in its policy towards Somalia and stated that it will seek stronger ties with the regional states of Somaliland and Puntland. Since the TFG is hopelessly divided and controls only a few road blocks in Mogadishu, Puntland (and of course Somaliland) appears to be a more reliable local partner in the fight against terrorism. There have also long been rumors that the Puntland Intelligence Service (PIS) is supported by Western (in particular US) agencies. So how does this relate to Puntland’s role in the fight agianst piracy? The Puntland Government: Profiteer or Adversary to Piracy? Pirates have been operating off Puntland since the 1990s. But only in 2008 attacks significantly increased, when the country went through a major economic and political crisis. Since then, pirates have grown stronger and many pirate gangs are nowadays better equipped than Puntland’s security forces. However, the international community has long been reluctant to support Somali actors against piracy and refused to build up their military and naval capacities. International actors have been cautious about contributing to a further militarization of the Somali conflict. Especially Germany expressed worries that Somali coastguards might switch sides and join the pirates, given such incidents happened before, when soldiers trained for the TFG went to fight for Islamic militants. Such concerns are fed by the UN Monitoring Group on Somalia, which suggests that Puntland officials are involved in the piracy business. In fact, piracy leaders are said to move around freely in Puntland’s capital Garowe. Puntland denies these accusations and argues that it could do more against piracy if it would receive further support by the international community. Indeed Puntland authorities have initiated counter-piracy policies. Puntland security forces have cracked down pirate hideouts. A substantial number of pirates have already been arrested and tried. An estimated number of 250 pirates are currently jailed in Bossaso, more than in any other country. Moreover the government has sponsored a public awareness campaign to discredit piracy and discourage people from joining piracy gangs. For the campaign the authorities have collaborated with members of the Diaspora, religious representatives, clan leaders and community activists. It is also negotiating with pirates to give up their business. For some these measures are however no more than lip service, have been inefficient and serve to shadow the role of Puntland officials in the piracy business. Despite the (alleged) complicity of its officials, cooperating with the government is inevitable if one wants to fight piracy onshore. After all, Puntland has already made some promising efforts to curb piracy. The relationship between Puntland and the international community is certainly difficult. But at least the Puntland government represents a local and legitimate actor to partner with. The international community seems to increasingly acknowledge that. More common efforts will however be needed to explore how better collaboration can be achieved. Middleton, Roger. 2009. ‘Roger Middleton: If we want stop top Somali pirates, we must look onshore’. The Independent, 18.02.2009. Grant, George. 2009. “Somali pirates can’t be beaten at sea”. Guardian.co.uk, 18.11.2009. Hesse, Brian. 2010. ‘Lessons in successful Somali governance’. Journal of Contemporary African Studies 28(1): 71-83.
 International Crisis Group. 2009. 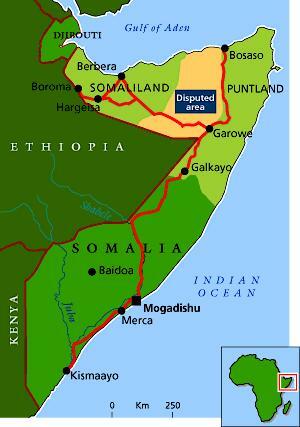 ‘Somalia: The trouble with Puntland’. Africa Briefing N° 64. Nairobi/Brussels: ICG. ‘US to seek stronger ties with Somaliland and Puntland’. BBC News, 25.09.2010. ‘Somalia: Puntland govt orders PIS to relocate’. Garoweonline.com, 05.04.2009. Germany doubtful of French plans to train Somali troops. Spiegel Online. 25.05.2009. UN Monitoring Group on Somalia. 2010. ‘Report of the Monitoring Group on Somalia pursuant to Security Council resolution 1853 (2008)’. S/2010/91. See also our blog entry on ‘Gunmen, Fish and Puntland’. ‘Somalia: Puntland to launch new offensive against pirate bases’. Horseed Media, 15.09.2010. Government of Puntland. 2010. ‘Press Release. Somalia: Puntland government continues anti-piracy campaign, rejects monitoring group accusations’. Garowe, 11.03.2010. UN Monitoring Group on Somalia. 2010. ‘Report of the Monitoring Group on Somalia pursuant to Security Council resolution 1853 (2008)’. S/2010/91.